Reporter's Note: The President has asked people to write with ideas to help the country. I’m writing a letter a day. I am mourning the loss of a friend this weekend, who used to show up on my porch. 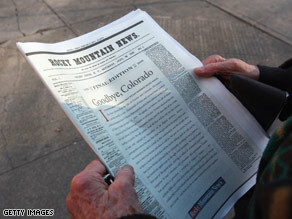 When I lived in Denver, The Rocky Mountain News was a newspaper I admired and enjoyed. It was well written, well reported, and in the days before the Internet became king, it was a solid way to keep track of what was going on. And now it has flown its last banner headline. Newspapers are folding, or threatening to, everywhere: New York, Miami, Seattle, Chicago, Los Angeles, Philadelphia, and more. Advertising has dried up, costs have gone up, and computers have eaten up their readers. I, like millions of others, now get a massive portion of my daily news by surfing news sites.